Congratulations Richard Ashby, Winner of Event 5: $1,100 8-Game Mixed Event (AUD$23,800)! Just like the English Ashes cricket team, The Old Enemy has once again come out on top, with England's Richard Ashby defeating Australia's Bruno Portaro heads-up for the 2011 Aussie Millions $1,100 8-Game Mixed Event title! Ashby is certainly no newcomer and he's been to the Aussie Millions plenty of times before. 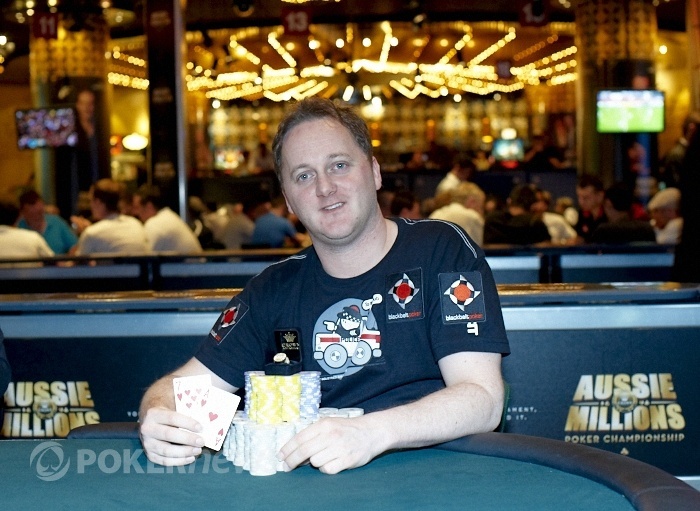 In fact, Ashby's first Aussie Millions title was way back in 2005 when he won a $200 No Limit Hold'em side event. Since then he's recorded six final table appearances here at Crown Casino, including a seventh-place finish in the 2009 Aussie Millions Main Event and a third in the $10,500 H.O.R.S.E. 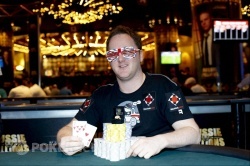 event in 2010 before following that up with a runner-up finish in the WSOP $10,000 H.O.R.S.E. in the same year. Ashby also has the 2010 WSOP $1,500 Seven Card Stud bracelet to his name and over $1.1 million in tournament winnings across almost every discipline of poker. There's no denying that Ashby is a forced to be reckoned with in mixed games, and his powerhouse display against a stellar final table today is proof positive. We're sure to see more of Ashby over the course of the series, but in the meantime, he's off to celebrate in true Pommie style - with his mates, at the bar, with a couple of pints. Warm one up for us, Richard! And with that, it's time for us to go, but stick with us as coverage of Event #6: $1,100 No Limit Hold'em Six-Handed continues. Be sure to also join us tomorrow when we bring you the final table of that event, plus more of the Full Tilt Poker $25,000 Shootout Invitational and Event #7: $1,150 No Limit Hold'em with Rebuys. Until then, from all of us at PokerNews, it's ciao for now! Bruno Portaro Eliminated in 2nd Place (AUD$16,320); Richard Ashby Wins! With Australia's Bruno Portaro down to 95,000 in chips, it was a matter of time before he made his last stand. Portaro raised from the button to 17,000 and Richard Ashby called from the big blind before checking the flop of . Portaro announced all-in and Ashby paused for a few moments before making the call, turning up against Portaro's . "I can get lucky, come on," Portaro said. No dice. The turn of the and the river kept Ashby ahead all the way and Portaro was confirmed as the runner-up, taking home a cool AUD$16,320 in prize money. Bruno Portaro opened the button with a raise to 16,000 as Richard Ashby made the call and both players checked the flop. Ashby led out for 22,000 when the landed on the turn before Portaro slid in a bet of 62,000. Ashby deliberated for a few moments and made the call as the rolled off on the river and Ashby checked over to Portaro who announced a bet of 40,000 before sliding in 70,000. The Tournament Director advised that the announced bet of 40,000 would stand, and with that, Ashby made the call. Portaro tabled his for a bluff as Ashby tabled the winning . With that pot, Portaro is left with just 95,000 as Ashby soars to 585,000 in chips. 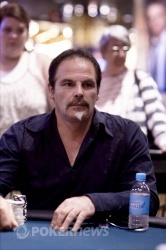 Bruno Portaro is down to just 150,000 in chips after losing a sizeable pot to Richard Ashby. Ashby brought-in, Portaro raised and Ashby called before calling Portaro's bet on fourth street. Portaro check-called Ashby on fifth, then led out on sixth street and Ashby called before check-calling Ashby on the river. Bruno Portaro brought-in and Richard Ashby completed with Portaro making the call. Ashby led on each street - with Portaro raising fifth and getting called - as each player's board read as follows. Ashby tabled his for a straight to collect the pot and further his lead. The cards are back in the air and the game has changed to Seven Card Stud. Not one hand got past the initial deal during the Razz section of this heads-up battle, but it should be noted that Bruno Portaro had to bring-in every hand! The clock has been paused and the players are now on a quick bathroom break. Back soon! On a board of we found Bruno Portaro pushing out a bet of 20,000 from the button into Richard Ashby. Ashby thought for some time before making the call, only to be shown the of Portaro for a flush. With that hand, Portaro snatches the lead - albeit by just 10,000.